Why is it important to choose Guardall Cash Safes in the home? Family heirlooms, valuables, and cash need a safe storage in the home. The thing that probably stops homeowners from acquiring a safe in the home is the trust issue. Purchasing one from a dealer also means divulging the area of the safe. In our present crime-riddled society, this concern is quite understandable. However, Guardall did not become one of Australia’s top names in the the safe industry if their reliability is questionable. Guardall guarantees customers secure and trustworthy safe installation in every Australian home. All certified Guardall dealers have police clearance as a guarantee for uncomplicated and safe installation for any chosen Guardall cash safe. All a homeowner like you needs to do is to browse the list of Guardall Cash Safes or ask help from your local Guardall dealer to pick out the model best fitted to store your valuables, documents, and jewellery. Why is it important to choose Guardall Cash Safes for your small business? 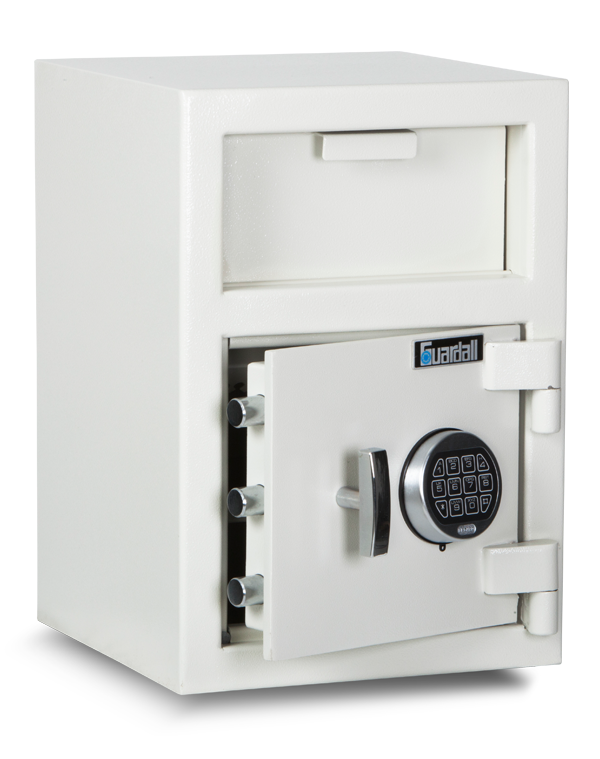 The on-the-site income from a day-to-day business can be secured perfectly by choosing Guardall Deposit Safes. Cash safes are an important and critical investment for small business owners, as they prevent loss if your business ever encounters theft, fire or other damages to your property. Cash safes can be readily purchased from any Guardall Premium Distributor or Dealer located in all major Australian cities including Brisbane, Canberra, Sydney, Perth, Adelaide, Melbourne, and Darwin. Your search for the best protection for your daily cash deposits ends with Guardall Deposit Safes. The dealer closest to your business address will be more than happy to help you get the right Guardall Safe for cash management needs. All Guardall dealers and distributors have police clearance which makes them a trusted choice to install your chosen Guardall Safe. Why is it important to choose Guardall Deposit Safes for large cash management needs? Guardall Deposit Safes have it all when it comes to securing and protecting large cash management and other valuables. There are a variety of models to choose from, and selecting the right one comes down to your business’ needs. If your primary worry is robbery, choose a product that can be anchored securely in your premises for the best protection. If fire protection is the top priority, ask your dealer about flame resistance ratings. Get in touch with the closest Guardall dealer in your location now to get a stock list of the latest cash safe designs that are guaranteed to protect your cash and other documents. Choosing the right safe for your large cash management needs becomes quick, easy, and convenient with the help from any Guardall distributor or dealer. All distributors and dealers of Guardall Deposit Safes have mandatory and updated police clearance. This ensures that every installation transaction with them is guaranteed safe, secure, and uncomplicated. What is the edge Guardall has over the competition? Burglaries are common things we learn and hear about every day. The only way to be one step ahead of them is to have cash safes that are designed to safeguard and protect your money, valuables, or documents. All Guardall safes are manufactured to meet best industry standards. With solid steel bodies and options between pick resistant key locks or commercial digital locks, Guardall cash safes . are guaranteed to meet every consumer’s discriminating needs for safe and secure protection. Our cash safes are all subjected to rigorous tests to make them to ensure effective protection of your valuables. Best of all, Guardall has police-cleared distributors and dealers that are certified to deliver and install all Guardall safes. We have dealership locations in all major cities in Australia.